Alpenhorn and its friendly staff set the scene for an enjoyable and value packed holiday for guests travelling solo or with family and friends. Located in the heart of the Thredbo village, Alpenhorn is only a short walk to the Village Square and all the activities that Thredbo offers. 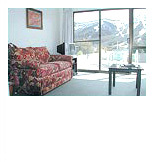 For the quieter moments enjoy the mountain views from the large deck or BBQ in the sunny courtyard. 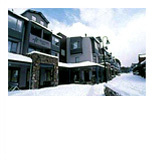 Luxury, location and lifestyle are offered by these spacious apartments located on the Village Square in the very centre of Thredbo, with restaurants and shops at your doorstep. Balconies, mountain views, car space, plasma TV, DVD and sound systems (with complimentary CD and DVD library for guests), kitchens and laundries fully equipped with quality appliances are just some of the luxuries you will enjoy in most units. A number of units also have spa baths and fireplaces. 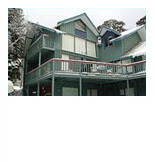 These units were included as one of the ten NSW properties in the SMH 52 Weekend Getaways for 2007. 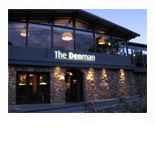 Boutique accommodation comes to Thredbo at The Denman. Choose from light-filled, airy, mountain view rooms and suites through to compact, comfy, European style chalet rooms retaining all the original charm without compromising modern convenience. End your day with a massage at Spa Denman. The Terrace restaurant and Apres bar are ideal for weddings and were highly rated in the Good Food Guide. 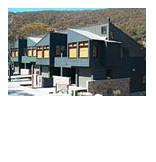 Come and stay in Thredbo's only 5 star accommodation. 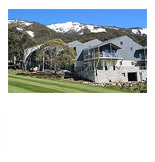 See why Vogue rated this luxurious complex of chalets as the place to stay in Thredbo. Enjoy a premier position in a secluded setting amongst the snow gums lining the Crackenback Supertrail. All chalets offer king beds, multiple bathrooms, spa bath, steam room, fireplace, gourmet kitchen, floor and central heating, drying room, double glazing, balcony and undercover parking. 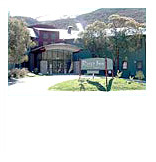 A family friendly inn located just opposite the Thredbo Leisure Centre and adjacent to the Friday Flat beginners area. Designed in contemporary style, the River Inn blends beautifully with Thredbo's high country. Guest lounge and bar with fireplace, plus bistro, cafe & restaurant, mountain bike storage & full conference facilities. These luxury one bedroom and loft chalets combine comfort and space with modern design and features, next to the golf course in Crackenback Ridge. Each apartment has 2 bathrooms one with a spa, an extra powder room and a fully equipped kitchen. Apartment 1 has a sauna and all have a balcony complete with BBQ. Located in a commanding position overlooking the village most of Lantern's 4 star apartments have balconies with spectacular views. All offer great features such as kitchens complete with microwave and dishwasher, stereo/CD players and laundry facilities. Each apartment has access to in-house movie channels, a resort information channel and Austar satellite TV.